Since his first novel was published in 1974, Stephen King has stretched the boundaries of the storyteller as a writer who constantly redefines his readers' experience by working in various genres and formats. Whether in an epic horror novel, like THE STAND, a serial-novel like THE GREEN MILE, or a novella like SHAWSHANK REDEMPTION, King is able to deliver a reading experience like no one else can. As quickly as a spider spins its web, King reminds us why he's the master of the novella - a format which, up until now that is, one might have thought is fast disappearing. In his new novella, UR, King is at his unsettling best as he examines the future of the written word - for better or worse. Following a nasty break-up, lovelorn college English instructor Wesley Smith can't seem to get his ex-girlfriend's parting shot out of his head: "Why can't you just read off the computer like the rest of us?" Egged on by her question and piqued by a student's suggestion, Wesley places an order for Amazon.com's Kindle eReader. The [pink?] device that arrives in a box stamped with the smile logo – via one-day delivery that he hadn't requested – unlocks a literary world that even the most avid of book lovers could never imagine. But once the door is open, there are those things that one hopes we'll never read or live through. Firm, gripping, and deftly written by a craftsman at the top of his game, this is King at his crisp, clear, page-turning best. 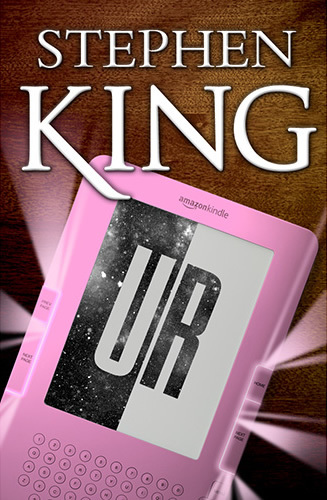 Author Stephen King announced today that he is releasing a novella, “Ur,” which will only be available on Kindle. At the center of Ur is lovelorn college English instructor Wesley Smith, who can't seem to get his ex-girlfriend's parting shot out of his head: "Why can't you just read off the computer like the rest of us?" Egged on by her question and piqued by a student's suggestion, Wesley places an order for a Kindle. Smith’s Kindle arrives in a box stamped with the smile logo and unlocks a literary world that even the most avid of book lovers could never imagine. But once the door is open, there are those things that one hopes we'll never read or live through. Ur is available for pre-order beginning today and will be released later this month. For Kindle customers who pre-order, King’s new novella will download automatically when it becomes available.